Official EditPad Pro web site - Download EditPad Pro. There are many text editors available for Windows. Some are small and fast, but offer little time-saving functionality. Other editors offer every possible feature the developers could think. They are difficult to use, bewildering you with many options, and new bugs are introduced whenever new features are added. What I like most about EditPad Pro is that it is very convenient to use. For my daily tasks I have to use a text editor all the time. Those tasks include writing letters and memos, setting up and maintaining several web sites, writing scripts in several scripting languages, etc. While EditPad Pro may not have every feature that might be useful every once in a while, it does have all the functionality that I need on a day to day basis. More importantly, its well thought-out design allows me to do my work quickly. Each file I open is put into its own tab and I can quickly switch tabs with the mouse or the keyboard. Useful information is instantly visible in the status bar, and often used commands are available in the tool bar. Both are fully configurable, and can even be completely hidden. There are many little features that make EditPad Pro very convenient. For example, the spell checker is linked with the syntax coloring schemes. If I unleash the spell checker on one of my Perl scripts, it will only attempt to spell check strings and comments. Those are supposed to be human readable. The spell checker won't bother with the actual Perl code. That's for the Perl interpreter to check. 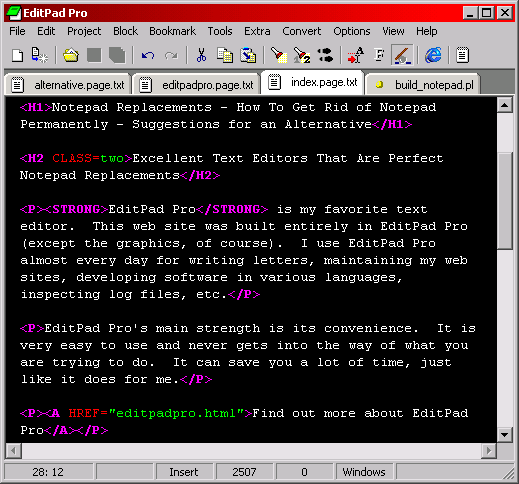 EditPad Pro also edits UNIX (and Macintosh) files. It will maintain the format a file has, and I can convert as I want. Since my web server runs FreeBSD, my Perl scripts must be in UNIX format if I want to run them on the server. With EditPad, I don't have to worry about this. A glance at the status bar indicates the format, and a click on the indicator allows be to convert the file. A feature that I use a lot is the Tools menu. I can add any external program to the Tools menu. EditPad can send the contents of the active file to the tool, and capture its output in a new tab, if I want. This is very handy when developing scripts in a language like Perl. The tools menu will only list the tools applicable to the active file. In the screen shot, the active file is a Perl script, so the Perl interpreter is the only available tool. And I almost forget to mention the search and replace feature. For me, the way the search and replace feature is implemented, can really make or break a text editor for me. 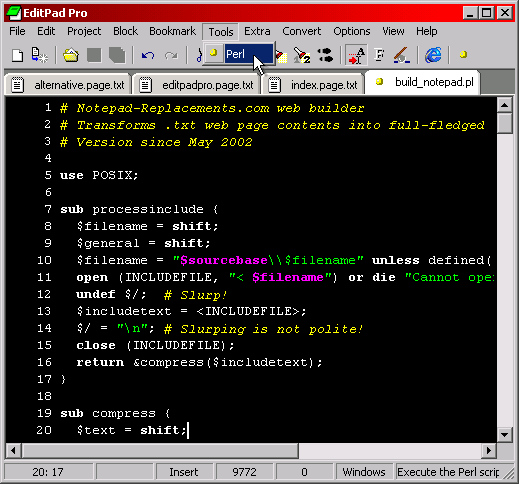 Most text editors use a popup window to enter the search and replace texts and options. This popup window always gets in my way. In EditPad Pro, the search and replace function has its own pane in side the main window. Ctrl+F shows the pane, Escape hides it. Quick and easy. Also unlike most text editors, the boxes for entering the search and replace texts are full-fledged multi-line editors, just like the main editor. Very handy when searching for larger pieces of text, or when using complicated regular expressions. Read more about EditPad Pro on the official EditPad Pro web site, or download your own copy of EditPad Pro now. You won't regret it!